Get rid of fruit flies for good by following these simple steps! The internet is full of homemade traps, tips, and ideas to get rid of fruit flies, but few actually address getting rid of them for good. Do you want a fruit fly death trap (gross!) sitting on your counter for weeks? Follow these steps to get rid of fruit flies from the source in a matter of days. A fruit fly invasion can be frustrating. And, trying to get rid of fruit flies can be just as frustrating. The tiny little bugs fly everywhere, destroy your fruit, and generally just annoy the heck out of homeowners and their guests. An invasion is usually started by simply bringing in fruit that happens to have fruit fly eggs on it. Yuck. You can purchase traps, but that is only addressing part of the problem. A couple of fruit flies can create new fruit flies in as little as 7-13 days (This might happen before you even realize you have an infestation. It is highly likely that when you need to get rid of fruit flies they are already into the breeding and egg laying generation). This fast reproduction rate means you have very little time to get them. But, once you find the source you can be rid of them in a matter of days. A fruit fly trap will kill adults that have usually reproduced already. No good, trying to get rid of fruit flies after they have started laying eggs can be a never ending battle. You might think you have the problem under control just to realize there are more just a couple days later. A week after the original fruit flies get into your home and you will have new ones popping up EVERY DAY! Even if you kill those original fruit flies, you run the risk that they have already found a location in your home to breed and they will pop up again, and again, and again until you take care of the fruit fly source. Follow these simple steps to get rid of fruit flies from the source. Fruit fly traps work great when trying to get rid of fruit flies, but will not keep up with a reproducing population. 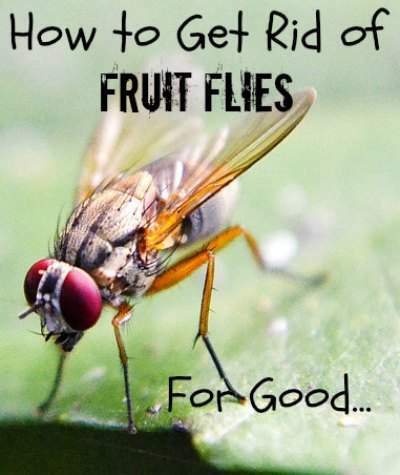 They will make you feel good because they work and you will see many fruit fly bodies floating in your trap, but they catch that number because the fruit flies just keep coming! You will see the trap working and you will still have fruit flies buzzing around your head. Frustrating. Nevertheless, traps should be your first step. Start killing those fruit fly adults off! You can purchase traps to get rid of fruit flies. These Terro Fruit Fly traps are my favorite if you decide to get rid of fruit flies with a store-bought trap. They work great and are not really noticeable if you have guests around. The Terro fruit fly traps work a little bit differently than my homemade version (they have a cone entrance so the flies can get in, but not out whereas my homemade version of a trap to get rid of fruit flies will simply pull the fruit flies under the surface), but if you are just trying to get rid of fruit flies then the end result of a homemade trap and a store version is the same. Get rid of fruit flies from the source and you won't have to constantly trap them. You can also make a homemade trap to get rid of fruit flies. These homemade fruit fly traps will get rid of fruit flies (good enough that we would use homemade fruit fly traps in the fruit fly lab to catch the occasional escapee). The oil is optional, but it draws them to the bottom so there is more surface area to attract new fruit flies. Most sources recommend apple cider vinegar, but I found that fruit juice usually works even better (especially a sweet fruit juice like pear, peach, or apple) and I have heard that wine is also a great option when trying to get rid of fruit flies. I used to work in a fruit fly lab and we used the homemade trap above for our fruit fly escapees. If you need to get rid of fruit flies, it works well and you can even make them in a mug or baby food jar so they are not as noticeable as the large cone style traps. You can also find plenty of homemade trap instructions that ask you to create a cone similar to the store bought traps to get rid of fruit flies. If that is the type you want then give it a shot. They will work too, however, it is a little harder to make (if the paper you made the cone out of gets wet by slipping into the vinegar or the opening gets to large then you can loose many of them, especially if you put fruit inside so the fruit flies have a place to stand. With a fruit fly trap like that, you have lots of live fruit flies in your trap with a paper lid (not always the best option when trying to get rid of fruit flies). The fruit juice or apple cider vinegar will attract the flies. The dish soap destroys the surface tension of the liquid so when the fruit fly lands on it to feed it is sucked under. If there is oil at the bottom the fruit fly will eventually get pulled into that so it is under the surface of the juice or apple cider vinegar, leaving more area for the living fruit flies to land on. Now that you are actively killing off adults you need to find their food and breeding ground. The most likely suspect is fruit. Check all of your fruit. 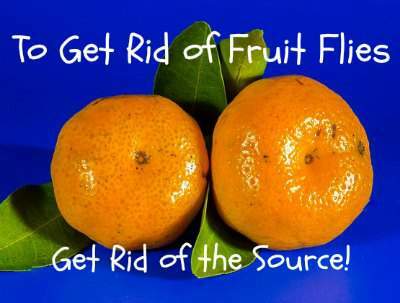 If there is a fruit fly infestation then get rid of fruit flies, you need to get rid of the fruit. An adult fruit fly can lay up to 500 eggs so it doesn't take long before you have a huge amount of fruit flies buzzing around your home. Another place fruit flies love to hang out is in potatoes that are starting to turn. If you can't find fruit with an infestation then be sure to check potato bags! If you are going to get rid of fruit flies then you absolutely must find their source. Check garbage, compost bins, and mops (the first two are the most likely spots). A DIY underground composting bin or a compost barrel tumbler will not have the same problems with fruit flies as an open compost will have. 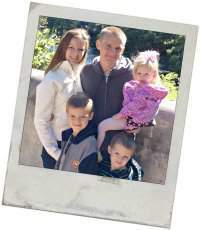 Follow Heidi Ramsey's board Organization & Cleaning on Pinterest. Drain flies and fruit flies are similar, but different. You would think that if the are in your drain then they are automatically drain flies, but that is not the case. Fruit flies will lay their eggs inside of a drain (especially a kitchen one), so to get rid of fruit flies for good you will need to clean the drains. I show you how to clean your drains in my post on how to deep clean your kitchen the natural way and I also list the steps below. If you have had adult fruit flies in your house for more than a few days then you have eggs somewhere. If you need to get rid of fruit flies and can't find infested fruit or potatoes then the next best location is the drain. Even if you found infested fruit, sometimes it is a good precaution to also clean the drains to get rid of fruit flies that happened to find a spot to lay eggs down there. It's a good thing cleaning your drain to get rid of fruit fly eggs is easy! Pour 1/2 cup of baking soda down the drain. Go slowly so it will get “stuck” on any residue inside of the drain. Follow that with 1 cup of vinegar. Once again go slowly. This time VERY slowly! Pour a little, wait for the fizz to stop and pour a little more. You want the vinegar to take out all of the baking soda and in the meantime it starts to loosen the grime (and clogs as long as they aren't so large that they are actually stopping the water at that point. If your water is backed up then you will need to snake it or use something more powerful that can push the clog through). Follow that with a pan full of boiling water. There isn't a science to the amount. I usually use a medium size pan. Since the grime was loosened with the vinegar and baking soda the boiling water will push them down the drain. It will also kill any fruit fly eggs that do exist down there. Since the traps are already set you are already actively killing the adults. If you took the fruit and potatoes away then they have no food. Cleaning your drains means they have no place to lay their eggs either. They will now be even more attracted to those fruit traps since that is their only option and, more than likely, will be gone within 24 hours. If you are still seeing large numbers of fruit flies a couple days later then look again for another infestation. If you followed the steps to get rid of fruit flies then it will not take long to get rid of them. If they are still in your home then there is another prime egg laying location for them. It could be that the drains were not cleaned good enough, you missed something, or maybe they have another spot (garbage can, compost bin, wet mops). The most likely location is a drain, fruit, or potatoes, but if you are still seeing them more than 48 hours later then definitely check those other spots! Find the location they are feeding at. Check fruit and potatoes (the most likely spots) and get rid of them. And that is how you get rid of fruit flies for good! this is so timely as we suffer from fruit flies very often in the spring and summer. thanks for the great ideas! you’re welcome. I hate the darn little things! This really works well though. They drive me nutso for a day or two then they are gone.